Recently I was asked to review the Landscape Adventure Photoshop Actions from Sleeklens.com. These actions are intended to speed up the editing process of landscape photographs while producing professional results. While I already have a workflow that I am very happy with, I was excited to see if these actions could improve my normal ritual. First of all, if you have never used Photoshop actions before, they are almost always super easy to load into the program. Such is the case for these actions. A YouTube video is provided from Sleeklens to guide you through this short process. Once loaded, you will have 56 actions at your finger-tips. To get you started, Sleeklens also provides a how-to video to illustrate the basics the actions work. 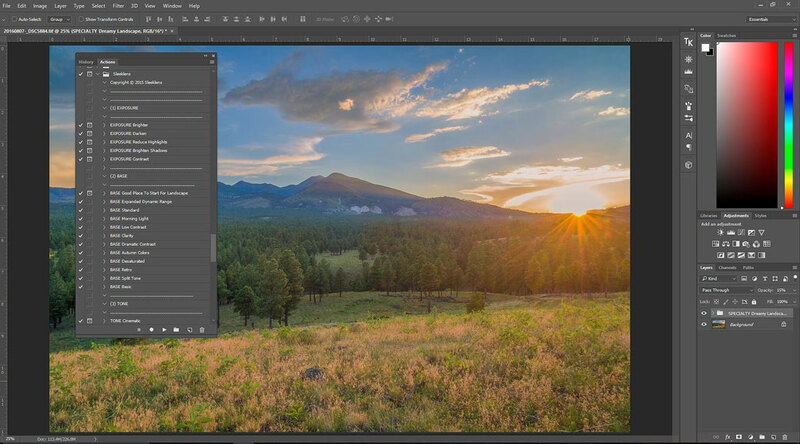 This 19-minute guide shows step-by-step the start-to-finish process of editing 3 different landscape photos. At an average of about 6 minutes per photo, this is a pretty quick editing time. Once the user is proficient at knowing which actions should be applied in a given editing situation, I’m sure that 6 minutes is a reasonable time to expect to finish a photo. After watching the how-to video, I tried out the actions myself on a couple different photos. All the photos were converted from their RAW format using my own workflow in Adobe Lightroom, so once I imported them to Photoshop, so no massive adjustments would be required. I found that most of the actions at their default 100% strength were too strong for what the photo required. Most of the time I would take the opacity slider and move it to 10-35% after the action ran. Doing this I found that I was able to fairly quickly make the small adjustments that were needed while maintaining the natural realism that I seek in my photography. In the comparison below, the left side shows what the image looked like after the RAW conversion done in Adobe Lightroom. The right side shows what the final image looked like after processing in Photoshop with the Sleeklens actions. You can see that the original still looks a little flat, with a boringly neutral color balance. I was able to dial in the contrast and color quite well. I edited the same photographs using my normal workflow as a comparison, and decided that the images from the Sleeklens actions can get pretty close to the same results, with only a couple caveats. The most noticeable item is where Sleeklens actions blew out the highlights a bit in the bright tops of the clouds. My normal workflow granted me the extra control to keep the highlights under control while dialing in the proper contrast levels. The other caveats are similar: the Sleeklens actions don’t quite give me the same control over the local contrast, luminance, and color balance compared to my normal workflow. The image below shows the Sleeklens results on the left and the results from my normal workflow on the right. Overall, I was pretty impressed by the results I was able to get from these actions. For a photographer that shoots and processes a lot of landscape images and still wants reasonably high-quality results fast, the Sleeklens Landscape Adventure actions are likely to be a great workflow solution. However, due to the lack of ultimate control over the image, I don’t think these actions are the end all solution for someone like me that looks to achieve the highest quality above all else. In my experiences, I have found that I value having some extra control to dial in the image exactly how I want it, and the Sleeklens actions were a little too automated for my taste. Even considering the fact that I can go into the adjustment layers created by the actions and change the adjustments myself, I prefer the ultimate control I maintain in my normal workflow. I will continue experimenting with these actions, and will likely incorporate some of them into my workflow where appropriate. Ultimately though, I see the Sleeklens Landscape Adventure actions not as standalone workflow, but as another tool to add to the toolkit. Disclosure: The author was provided with a free sample from the Sleeklens.com for review purposes. This review is my own opinion, which I formed after personally using the Sleeklens Landscape Adventure Photoshop Actions.